“My social worker is my last hope. My social worker will help me get out of a life of abuse.” O, how that last hope would disappear if the social worker in question could not be trusted to do the right thing. 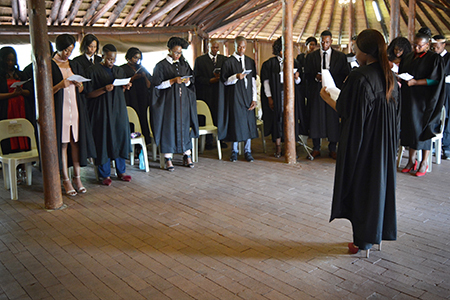 Steering them in the right direction, the second-year social work students on the North-West University’s (NWU’s) campus in Vanderbijlpark recently undertook their professional oaths. By doing this, they affirmed their commitment to the ethical regulations of the profession. Each student also received a certificate to proclaim their dedication. Dr Erika Stutterheim, professional conduct chair at the Board of Social Work attended the event. She said that when students take this oath, they acknowledge that they understand the ethical conduct required from a social worker, whether as a student or as a registered practitioner. The keynote speaker was Langi Malamba from the Council of Social Service Professions, an independent legislative body that regulates conduct within social assistance professions. Ms Malamba told students the story of a girl who fetched water with her friends every day. Her friends had new, brightly coloured pots, but her pot was old and broken. She asked her grandmother why she couldn’t have a pot like her friends. Her pot looked terrible, and it leaked so much that by the time she got back to the village she was soaking wet. Her grandmother walked with her to the well and asked her which path she took. Where her friends walked, the pathway was dry and dusty. Where the girl walked every day, the water dripping from her pot, kept the flowers watered, and her path was covered in cool green grass and flowers. Her grandmother told her that her hard work with a broken and ugly old pot had brought life. Ms Malamba said the same principle applies to social workers and the tough road they follow every day. “The professional conduct of social workers literally have the potential to save lives and bring about change,” she added. These students will now start working on real cases and will be exposed the real people with real problems. Their commitment to the profession and the regulatory bodies who will keep them accountable in practice, will be their guiding compass. Second-year social work students take the oath in unison.